PA chief negotiator - who recently sat in coalition with Hamas Islamists - says expanded Israeli gov't poses a threat to regional stability. Senior Palestinian Authority official Saeb Erekat reacted angrily to news that Avigdor Liberman of the secular-nationalist Yisrael Beytenu party will be appointed as Israel's new defense minister. 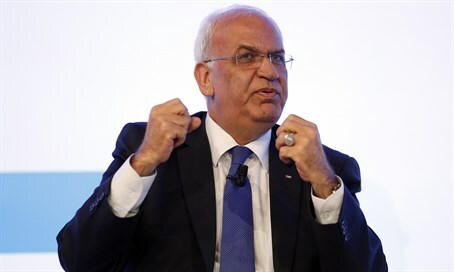 Erekat, who only relatively recently sat in a (now defunct) "unity government" with Hamas, a proscribed terrorist group, blasted Israel's expanded right-wing Israeli government as a "real threat" to regional stability. "The existence of this government brings a real threat of instability and extremism in the region," the PA chief negotiator told AFP. He further added that the appointment would "result in apartheid, racism and religious and political extremism." Hamas, Erekat's former coalition partners, calls in its charter for the destruction of the State of Israel and ultimate annihilation of the Jewish people, citing Islamic traditions. Erekat's comments follow Wednesday morning's press conference at which Netenyahu and Liberman officially signed and announced the coalition agreement between their two parties.